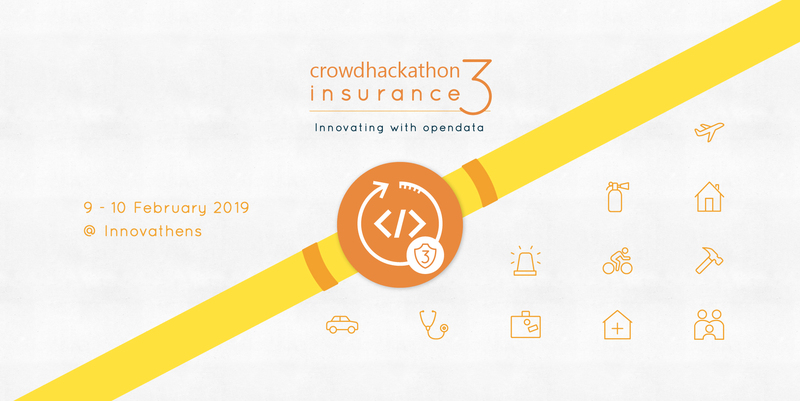 On 09 and 10 February 2019, the third two-day Innovation Marathon Crowdhackathon#insurance 2.0 (http://crowdhackathon.com/insurance3) will take place at INNOVATHENS – Hub of Innovation and Entrepreneurship of Technopolis in the City of Athens in Gazi. The event will focus on the creation of innovative applications (Minimum Viable Products – MVP) in the wider insurance sector (#insurtech). Crowdhackathon#Insurance 3 is organized by Crowdpolicy technology and innovation company and Ethos Media, with the support of insuranceworld.gr, within the framework of the open innovation event Crowdhackathon.com. Applications promoting Social Innnovation and Social Solidarity. Encourage young developers and entrepreneurs to network with experienced company executives and professionals of the insurance sector and cultivate conditions for dynamic synergies. Tools and methods for data analysis and visualization for support of risk management etc. Utilization of crowdsourcing mechanisms and methodologies in the insurance sector. Crowdhackathon#insurance 3 is mainly addressed to young entrepreneurs, programmers, analysts, designers, professionals involved in the sectors of communication, marketing, customer services, business consulting, as well as executives from the wider insurance and financial sector, university and highschool students and any other person interested in taking part and actively contributing to the development of applications that promote innovative youth and social entrepreneurship and financial activities through the – crucial for a country’s economy – insurance sector. Members of programmers groups involved in apps implementation, such as programmers, analysts, designers, consultants etc. Participation in groups of 2-5 people (desired). The best applications will be awarded by a special committee, which will base its decisions on criteria such as technological and business innovation, the possibility of immediate implementation, completion of the app within the duration of the hackathon etc. Representatives of companies or stakeholders from the insurance sector, who will mentor and support competitors by highlighting propositions, needs and ideas to be taken into consideration during the marathon. Volunteers who will offer assistance during the event. Visitors: these may be executives who work in private companies, public bodies or Non-Governmental Organizations. They will not take part in the competition but will observe the implementation procedures, presentations and the various parallel events. Data owners: these may be organizations of the public or private sector, which will offer data for utilization. Participation is FREE; there is a limited number of slots per role; participation is on a first come-first served basis. Registrations will open in the beginning of September. September 2017: opening of the electronic platform Open insurance dialogue for listing of needs, collaboration in setting the appropriate standards and promotion of good practices and ideas which may inspire the participating teams. The best pilot applications and services presented during the event will receive cash prizes and will be further developed with the support of the organizers and the participating companies.